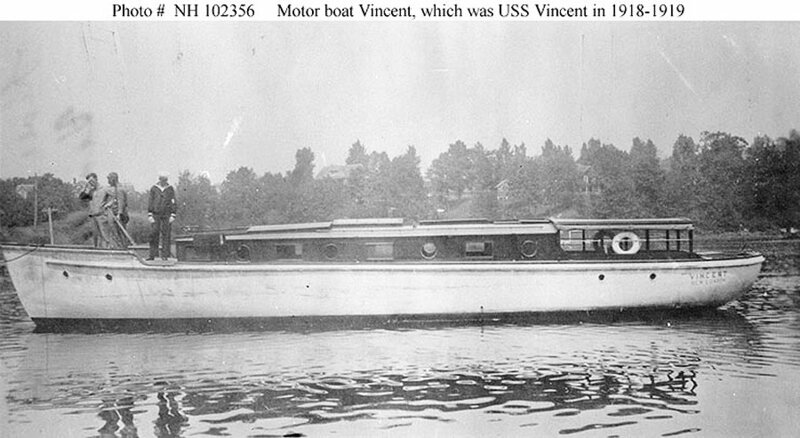 Motorboat: Built in 1909 by the Britt Brothers, Lynn, MA; Acquired by the Navy 28 June 1918 and commissioned the same day; Decommissioned 28 June 1919, struck from the Navy list and returned to her owner. Fate unknown. Specifications: Displacement 17 t.; Length 49'; Beam 10' 7"; Draft 2' 10"; Speed 9 kts. ; Complement four; Armament none. 103k Possibly photographed while being inspected for possible World War I Naval service, or while being taken over. Three Navy Sailors are standing on her foredeck.